There´s nothing particularly new here that can´t already be found on the GNX3 and GNX4, but the beauty of the GNX3000 lies in the details. The whole thing seems more concise and focused, and with the newly improved amp models, and you have a unit that does a great job with the minimum of fuss. Having initially been overtaken by Boss and Line 6 in the digital modelling race, DigiTech is now one of the prime movers in the field of combined multi-FX and modelling units. Along with Line 6, it is probably the company doing the most to push the boundaries and challenge our expectations of what a 'guitar rig' or 'effects unit' should do. This new-found confidence really kicked in with the GNX and Genesis range of modelling units, which took over from the higher end of the RP range as the company's flagship models.DigiTech has been steadily updating the GNX range with an ever-bewildering range of new features. The latest addition to the family is the GNX3000 that features some interesting developments. While there are plenty of new and improved models and effects, the unit seems more streamlined and focused than the 'kitchen sink included' GNX4. Most immediately apparent is the disappearance of the built-in eight-track recorder - which featured on both the GNX3 and GNX4. This makes sense; like its predecessor, the GNX3000 can be used (in conjunction with a PC) as a comprehensive footswitch-operated recording and signal routing tool and comes with free Pro Tracks Plus recording software. Computer-based recording is becoming more accessible all the time, so the built-in recorder is less of a selling point. 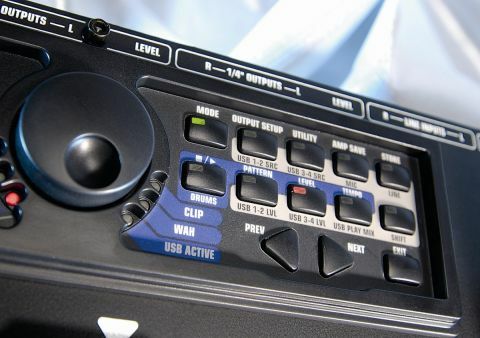 Rather than clutter the clear, intuitive control panel with more features, DigiTech has given us the choice: if you want to record, grab a USB cable and connect the GNX3000 to your computer. On the other hand, the built-in recorder was useful as a portable audio sketchpad, so perhaps there'd be a market for a GNX unit with a rudimentary single-track digital recorder for that purpose? In other respects, the GNX3000 is a natural progression in the general GNX theme. It has more processing power than its predecessors, with four of DigiTech's proprietory AudioDNA DSP processors (there are two in the GNX1, three in all other models). There are a whopping 43 amp models (including bass and acoustic rigs), 25 cabinet models and 11 stompbox models; these can be combined in any way you like, and two complete signal chains can be blended using the Warp function. You want more impressive specifications? How about a total of 57 effects, 11 of which can be used within a single patch? There's plenty of storage, enough for a total of 195 factory and user patches. The pickup modelling feature is retained (make your humbuckers sound like single-coils and vice versa) as are the Learn-a-Lick and Jam-along tools. For recording purposes, there's a built-in dbx brand microphone preamp, and the USB connection will support six simultaneous channels of 24-bit audio. There's no support for MP3 playback and the drum machine is less sophisticated than on the GNX4, but that suits the slight difference in emphasis between the two units. Set-up and operation is as simple as we've come to expect from recent DigiTech products, with just a few extra choices as a result of the unit's versatility. The exact function of all the footswitches depends on the main operational mode (selected by pressing footswitches 4/5 simultaneously). Bank mode will be familiar to most multi-effects users; scroll through the banks with the up/down switches and use the five main switches to select the presets within each bank. In Stompbox mode, the main footswitches are used like a traditional pedalboard. You have an amp channel switch, a tap tempo switch and on/off switches for three selected effects modules (stompbox, chorus/mod and delay). In this mode the up/down switches are used to scroll through the presets in linear fashion. In Rec/Drum mode, the five main footswitches control a number of recording operations, while the other two are used for selecting the drum machine pattern. Creating and editing patches involves a familiar 'Matrix' interface. On the GNX3000, this display is in two sections. The larger, lower part covers all the familiar effects modules, while the four-row upper section selects between standard amp controls, more complex settings for each of the two amp channels and the unique GeNetX 'Warp' settings. What's slightly confusing is that the GeNetX row has also had to be used for selecting amp models for the two main amp channels; it's an obvious space-saving necessity, but it does slightly detract from an otherwise intuitive layout. Round the back, the range of connections is pretty much the same as on the GNX4, but with a few differences. The mic input no longer has a phantom power switch as this is always powered up; however, there's no -20dB pad switch on the GNX3000, so you'll need to set the input level knob carefully. Similarly, the XLR outputs lack the ground lift and speaker compensation switches; there's probably a limited market for such details and they'd have an impact on price, so it makes sense not to include them on every product in a range. As with all versatile multi-FX units, the factory presets give a good impression of what the GNX3000 can do. However, such sounds are usually tweaked specifically to sound good in a demo situation and are generally too laden with effects for practical recording and gigging use. Luckily, those clever DigiTech programmers have included a whole set (Factory 2) of patches designed simply to show off specific amp or stompbox models, and what a set of sounds they are. Our initial impressions were along the lines of 'yep, another good solid set of amp models', but as we explored, isolating the amp/speaker models and then adding effects, we began to hear the quality more easily. DigiTech is pushing its new 'Component-Based Modelling' technology in its promo literature - the description (that every single aspect of the signal chain is analysed and modelled) sounds suspiciously like what Roland and Line 6 have been doing for 10 years, but maybe there's something in it. They certainly sound good. Particular favourites include the various 'Plexi' models, which have a tightness and presence without sounding brittle or over-trebly, and the 'Brit 15'- a lovely brown sound based on the Vox AC15 which is a delight to use. There are some interesting blends of two amp models ('Voxtwin' and the rich, meaty 'Jumprect') that work very well, and with more time, we'd relish the chance to try some of our own blending experiments. The acoustic models are never going to compete with specialised acoustic modellers such as the Yamaha Magicstomp, but they'll do for a tight situation. The bass models sound better, and while fairly rudimentary in range, offer useable sounds for home recording purposes. DigiTech has never had any problems in the stereo effects department, and there's a great range of reverbs, delays and modulations here. The Whammy and Talker effects are a company speciality, and its recent exploits in modelling stompboxes are well in evidence here; the Hendrix Univibe sound, for example, is a real cracker.